Considering the anniversary of the Battle of Neuve Chapelle has just passed by we thought it would be interesting to discuss the details of the battle here. The battle was led by Britain in the Artois region of France, where the Allies aimed to break the German line and allow the Allied troops to rush through to Aubers Ridge. In tandem, the French were to assualt Vimy Ridge. In theory, if both attacks were successful, the Allies would manage to cut off German supply lines by blocking roads and railways. The battle was the first deliberately planned British offensive of the First World War and was also the first time they were able to map the attack front through the use of the Royal Flying Corps. Unf ortunately the attack was largely unsuccessful. 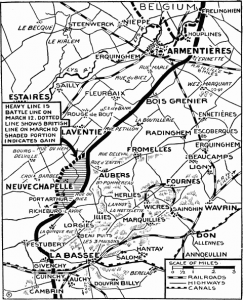 The French attack on Aubers Ridge was called off, British communication lines were interrupted, and the Germans were able to call for reinforcements. The Allies were able to move forward slightly, but not too much. Soldiers from the 1st Seaforth, 4th Seaforth and 4th Camerons took part in this Battle, many of whom had not seen large scale warfare in action yet. 40,000 Allied troops took part during the battle and suffered 7,000 British and 4,200 Indian casualties.The Germans lost around 10,000 troops. Joseph Gray, the war artist, who was a member of the Black Watch , painted a scene of the battle featuring the 4th Seaforth. The painting accurately portrays the horrifying conditions the men faced when in battle. Although the battle was not a win for either side, it proved to the British that they could mount an offensive attack after months of stationary fighting. The Battle lasted from the 10th – 13th March 1915.